It’s pretty easy these days to feel like your mind or life is spiraling out of control. From juggling your busy schedule to handling the unexpected there just never seems to be enough of you to go around. The result is that you never really quite feel like you have balance in your life. So why exactly is balance important? When your mind and body is in balance, then you will instantly experience feeling calm. There’s no real magic or miracle to feeling calm, it happens naturally when you stop giving away energy to things that stress you. Stress is the biggest energy pirate that we have to deal with. It can sometimes be very subtle and creeps up on us bit by bit until suddenly we explode for what seems like no reason at all. The reason was that it had been building up inside you until there was no space left to hold it in. Most of us know what it’s like to lose our cool – it’s no fun at all. Worse than that, it can be a buzz-kill in your relationships. Not to mention the negative impact it can have on your health, happiness, and state of being. Think back to the last time you lost your cool. What was it that triggered it? Was it something that someone said or did that triggered your reaction? Or was it an injustice that happened to you, or something unexpected that took you by surprise? Just notice what triggers you. Regardless of what triggers your reactions, the bottom line is that it’s what went on in your head that caused you to react the way you did. It doesn’t matter what someone said or did because you can’t control that anyway. What matters is that you can choose to respond instead of reacting to the thoughts or feelings that you have. 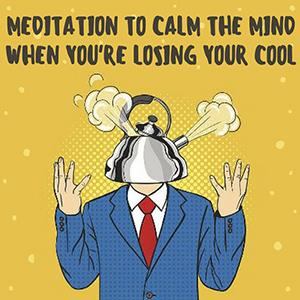 Learning to respond instead of reacting is the essence of training the mind to be calm. It’s not until you can do this anytime you want that you’ll truly have peace in your mind, body, and relationships. Don’t expect to learn how to do this overnight as our knee-jerk reactions to what goes on around us are deeply ingrained. Instead, practice taking at least one slow, deep breath the moment you feel yourself being triggered by something. If you can, follow up with another one or two slow, deep breaths. This will help break the action-reaction cycle. A is for Acknowledging. Simply acknowledge what you are thinking or feeling without judgment. B is for Breathing. Take a few slow, deep breaths before saying or doing anything in response to whatever the trigger was. C is for Choosing. Choose how you want to respond to the situation (if you need to respond at all). Just by following these three steps every time you feel like you are about to lose your cool you’ll find it easier to stay calm and retain balance in your life. The more you practice this, the easier it gets and the better you get at applying it. Pretty soon, you’ll have all the balance in the world to enjoy.